You can click the photos to expand them, but basically the miniatures themselves are printed in high quality liquid resin. That translucent blue material makes it a little difficult to see the detail, but in the below photo where I've primed it, you can see that it's quite excellent. If I compare a close up of the face detail, to the 3D model itself, it's very close. There's a little lost around the teeth and while the 3D model's mouth is slightly open, that's lost in the final product. Now, there's still a bunch of detail amongst the teeth, but that open mouth was an intentional test on my part as you'll see later compared to a previous model I ordered from Hero Forge. "The supports in mine ... I add by hand so I make sure to do it in a way that misses the face and as much detail of the mini as possible. I then use brass cutters and diamond files to remove the supports and ship the model out." Now, there was a little support missed that I easily cut out (middle photo above) and some places on the miniature where you can see where the supports were. This is the trade off of no mold lines - they could be scraped / filed off or filled with putty in some cases, just like when you're preparing a miniature from a mold for paint. You will notice that around the top-right of the shell, some of the detail gets a little funny as those supports all wind in there. However, in the below photo, you can see that a little paint can still make everything look alright. I also found a few places where detail got a little funny. For example, look at the top of the pant leg below as well as the bottom of both pant legs. In the print, there are some scale-like texture spots and there's nothing where the bottom of the pant legs should be. My suspicion is this might be an issue with the source model itself, not the printing process, because things like textures through pants shouldn't just appear. You can see a final photo of the miniature at the end of this review. Again, part of the point of this review was to answer the question, "Why order through Impact Miniatures, when I can just design and order it through Hero Forge?" Well, below I'm going to look at some direct comparisons between pricing, service and quality compared to the miniature I previously reviewed from Hero Forge. Definitely a win on the Impact Miniatures side. They bill based on how much material it will cost to print, so if you put the model on a mount or make it larger or holding a bunch of stuff, it'll cost a little more, but typically you're looking around the $6-12 mark. You'll also have to pay for buying the STL file from Hero Forge which is a flat $10 fee, then shipping is also extra. My price comparison below uses shipping to Canada, which is a little more than their US cost. That's a pretty significant price difference and puts the cost of the miniature back in the realm of what you might pay for a nice single miniature from other miniature lines AND keep in mind you're getting something custom. With Hero Forge, you're ordering whatever you end up designing through their website. Impact Miniatures offers some custom work and Tom was a great guy to talk with and discuss his services. I'm planning on ordering some heads that he'll end up chopping off the miniatures in some 3D software for some custom work I want to do. 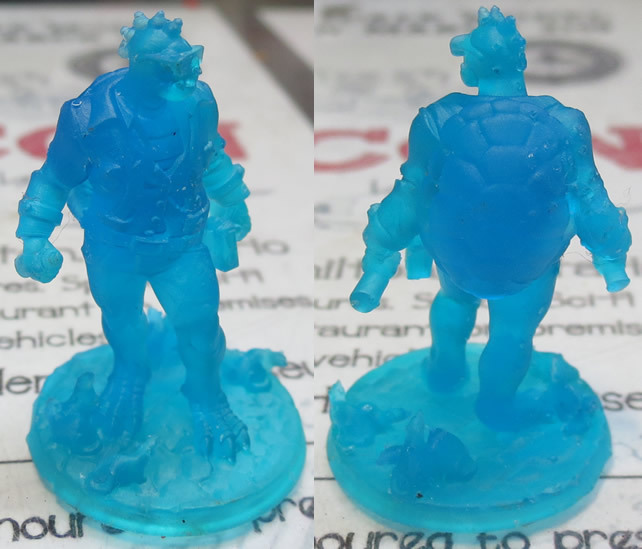 Looking at the actual final product, the below photo shows Hero Forge (left) compared to Impact Miniatures. (right) Impact's is nearly perfect from a surface quality standpoint. Smooth, with a little texture. Hero Forge still has a lot of surface texture, which while it didn't come through too badly in the final model after layers of paint were applied, in some places it was very noticeable. Below, you can see a larger full-body comparison once the models are primed. Again, Hero Forge on the left and Impact Miniatures on the right. 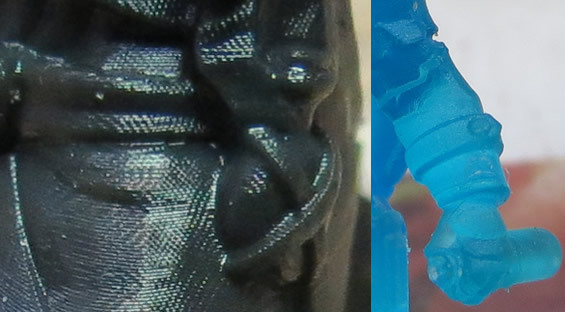 Below, the base on the Hero Forge model (left) has those lines very visibly prominent, even after painting. Impact Miniatures' base (right) has none of those defects. I wanted to compare the detail in the faces, though for the photo from Hero Forge used one where the paint job was still a work in progress, so lets focus on the level of detail. In both models, I had the mouth slightly open. With the Hero Forge model, none of the mouth detail was captured. No teeth, no inside of mouth, just a blank space. 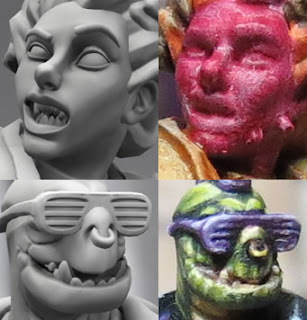 While Impact Miniatures wasn't able to capture the inside of the mouth either, they did capture most of the larger teeth detail, just not the finer bit. You'll also notice some pegs on the side of the face of the Hero Forge model, left over from supports. Again, Tom says he never runs supports to the face. Both miniatures had some printing flaws. With Hero Forge, (top row below) there were lots of little pegs from supports that had to be cut away. 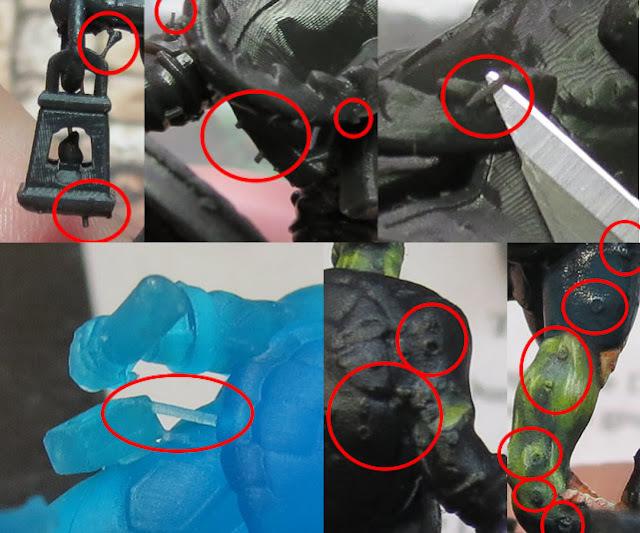 With Impact Miniatures (bottom row below) there were a few areas where supports left behind some blemishes and detail was lost. 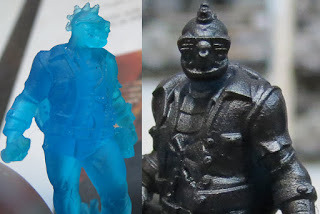 Impact Miniatures definitely stands out as an option when getting custom 3D printing done. (Not just what you might be designing on Hero Forge.) The price and quality easily sets them apart from Shapeways and it just makes sense to use them for the final leg of your custom prints. Yes, there's a little detail lost in a few places, but I think that as technology changes we just need to shift how we think about what we're used it. Instead of cleaning a mold line across an entire model, we're removing some of the support contact points. PLUS, these supports aren't being run through / to a piece of detail like a face. I've mentioned above that seeing 3D printing applied to our hobby excites me and Impact Miniatures is yet another step in the right direction. 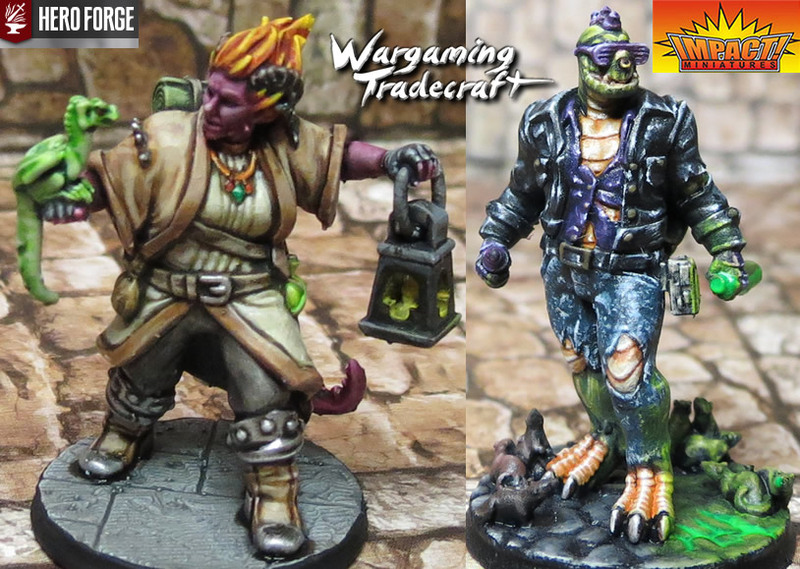 I was pretty happy with what I'd received from Hero Forge, because in the context of a custom designed miniature, everything from price to quality seemed reasonable. Seeing how Impact Miniatures improves on this process in all facets was really eye opening. I'd strongly recommend their services when you're interested in performing any custom 3D printing. 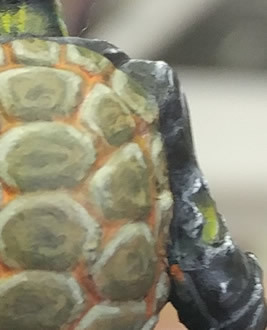 Stay tuned for a post looking at the paint techniques I used while actually painting my Punk Turtle, including how I painted those jeans. Leave a message in the comments! Have you used either of these companies? 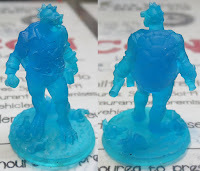 Have you printed your own 3D miniatures? What kinds of advancements do you want to see with 3D printing as it applies to our hobby?